A new Kothimora Khukuri to be called as KH Kothimoda. It is an upgrade to this wonderful Silver Khukuris known as Kothimoras, given to retiring gurkha officers and carried by groom on wedding. This new one has a redefined shape, more Khol butta and introduction of a brand new cho or Kaudi. It has a 5 cm belly blade with 2 Chire. The handle will be a mixture of water buffalo Bone and Horn. The blade alone weighs 700 grams. 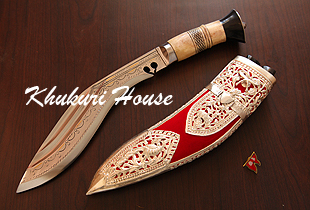 A pure silver filigree and it holds Khukuri House Logo.